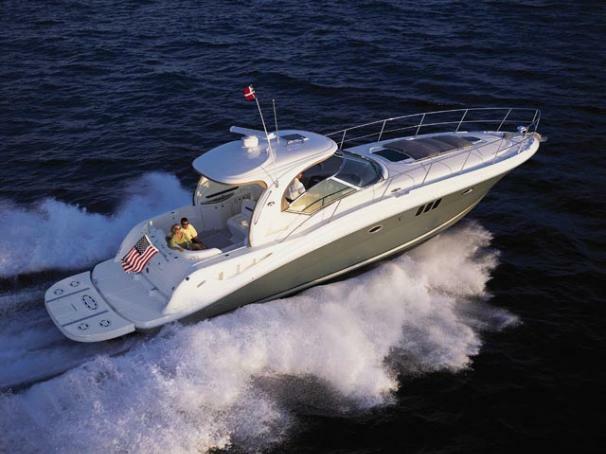 Boat Description Sleek styling, a large, comfortable cockpit and a luxurious interior that sleeps plenty are just the right formula for endless fun in the 44 Sundancer. A wealth of instrumentation and information is at the captain`s fingertips, and twin 8.1 S Horizon MerCruiser gasoline V-drives will get you to most any destination with ease. The beautiful, yet efficient, galley includes a host of conveniences that will make each on-the-water excursion thoroughly enjoyable. Engine Notes Cummins diesel and MerCruiser gas v-drive engines available.